Every year between their regular annual festivals, the San Francisco Silent Film Festival presents a smaller, single day event at which patrons are treated to all the vibrancy and excitement of the regular festival, on a smaller scale. In the past, the event has taken place in the winter, but as this year’s large festival took place 2 months earlier than years past, what was previously Silent Winter became Silent Autumn in 2014. As usual, Backlots was there for the action. The day began with Laurel and Hardy shorts, and though Saturday public transportation schedules impeded my ability to see all of them, I arrived in time to catch the final short. What I saw was choice. I have seen a good deal of Laurel and Hardy, and as a friend of mine put it, “It says a lot about Laurel and Hardy that when you just think about them, you smile.” Though I much prefer their silent comedies to their sound work, I must agree that seeing them in any situation puts a smile on the film fan’s face. I regret not seeing all the shorts, but I’m very lucky that I got there in time for the next showing…a rare treat. 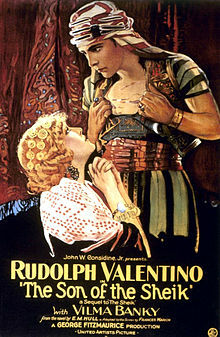 Next up was Son of the Sheik, Rudolph Valentino’s final film and featuring a new score by the Alloy Orchestra. Introducing the movie was noted Valentino author (and friend of Backlots’) Donna Hill, who discussed in detail the intricacies of filming and Valentino’s life at the time. It was a glorious movie with a magnificent score, and Donna’s introduction was a perfect segue into the experience. Valentino has been well-represented at the San Francisco Silent Film Festival this year. The opening night movie of the main 2014 festival was The Four Horsemen of the Apocalypse, a real crowd-pleaser and a Valentino staple, and Son of the Sheik seems to be the ideal way to round out a very Valentino-centric year. On the lineup after Son of the Sheik was a program from the BFI called A Night at the Cinema in 1914, showcasing several clips and shorts from that year recreating what a night at the cinema might have looked like. An eclectic program, featuring footage of the Austro-Hungarian royal family shortly after the assassination of Archduke Franz Ferdinand, a clip of a representative from the Shackleton Antarctica expedition inspecting the dogs that were to go on the trip, and an early Charlie Chaplin short set in, of all things, a movie theater. My favorite of the program was an uproariously low-budget short film called “Lieutenant Pimple and the Stolen Submarine.” Decades before Plan 9 From Outer Space, this short made the best of its low budget, complete with painted sea creatures and deliciously bad special effects. I have no doubt that if it were released today, it would become an instant cult classic. Following a lengthy dinner break came what was arguably the cornerstone of the festival, a showing of Buster Keaton’s comedy masterpiece The General. Though this film is shown often at silent film events and festivals, it never fails to draw a crowd and at 7:00, the Castro Theater was filled with devoted Buster Keaton fans waiting to see his most famed work. My mother, who became a budding silent film fan after I brought her to see Wings at the San Francisco Silent Film Festival several years ago, accompanied me to this screening and, I am proud to say, has now seen her first Buster Keaton film. The General, Buster Keaton’s most famous feature-length film, tells the story of a train engineer in Georgia who is rejected from the army but ends up making quite an impact on the war anyway, in a way that only Buster Keaton can. Accompanied by the Alloy Orchestra, we saw Keaton and his co-star Marion Mack perform clever gags and alarmingly advanced stunts, as well as what is considered to be the most expensive stunt performed in the history of silent film (a train toppling over a burning bridge). One of the things that strikes me most about The General is the characterization of Keaton’s female lead. She is a truly feminist character, often the brains behind solving the film’s complications, unafraid to get herself dirty or scale the side of the train. It is a refreshing look at the “damsel in distress,” as this damsel could clearly take care of herself. The next film was The Cabinet of Dr. Caligari, but my mom needed to get home and like a good daughter, I went with her. But yet again, the San Francisco Silent Film Festival met and exceeded my expectations, living up to my oft-repeated assertion that the San Francisco Silent Film Festival is the best festival of its kind on the West Coast. The main festival is in late May of 2015, and Backlots will be there as always. Stay tuned! This entry was posted in Lara Gabrielle Fowler and tagged buster keaton, rudolph valentino, San Francisco silent film festival, Silent Film, the general. Bookmark the permalink.